The first time I watched the hit television show Shark Tank, Pat McCarthy was pitching his new product, a perfume called Money that purported to smell like freshly minted greenbacks. "The smell of money, baby! Can I get an Amen?" McCarthy calls, as scantily clad models throw cash in the air like confetti. "Amen!" the Sharks testify in unison. "Love the pitch!" one of the potential investors beamed, admiring the bottle packed in shredded U.S. currency. "Genius!" One Shark bit to the tune of a hundred grand. McCarthy's offer weighed heavily on my mind as my startup, Youtopia, headed into the finals of the 1776 Challenge Cup. We were competing against 64 of the globe's most promising ventures in education, energy, health and smart cities; if funded, any one of these startups had the potential to completely disrupt its field. If I were a betting woman, after voting for us (naturally), I'd have put my money on Reaction Housing to sweep the whole thing. Unlike Liquid Money, Reaction Housing's EXO really is a genius idea. Back in 2005, while waiting in line at Starbucks, Michael McDaniel was staring at stacks of upside-down paper coffee cups, and fuming over America's breathtakingly tragic answer to hurricane Katrina. Then Eureka! He raced home and designed EXO, a stackable, lightweight, temporary housing unit that would efficiently fill a cargo plane or shipping container, an invention that could revolutionize how we respond to natural and manmade disasters. As I watched EXO lose to, ostensibly, an even better idea, I fumed over the kind of bizarro universe that bestows seed funding on l'eau de dough over humanitarian relief. If Michael pitched his idea on Shark Tank, would he send out adolescent flood victims in daisy-dukes and bikini tops carrying miniature FEMA trailers or Superdome snow globes? In a country that increasingly evaluates entrepreneurs in game show format (along with singers, chefs, designers, dieters, lovers, fill-in-the-blank), how can socially responsible startups ever capture the public's attention? Perhaps the brilliance of the Challenge Cup is that it combines the theatrical aspects of Shark Tank with the passion of entrepreneurs addressing seemingly intransigent societal and environmental problems. However, business savvy do-gooders are not created in a vacuum. If we want more viable mission-focused/for-profit startups in the pipeline, we need more accelerator programs like Chicago's Impact Engine. Lots more. Impact Engine runs an intensive sixteen-week boot camp that gives startups one-on-one mentorships, $25,000 of upfront funding in exchange for 7 percent equity, and free workspace at Howard Tullman's much acclaimed tech hub, 1871. Chuck Templeton, founder of OpenTable and current chairman of Impact Engine, seeks to erase the distinction between doing good and doing well. "Caring solely about profits is simply not rational anymore," Templeton stated at last year's Demo Day. "Our entrepreneurs see weaknesses in the status quo and they see ways to use new business models, or new technologies, or new social norms as a force for positive change. We're disrupting the current mindset of mission OR money with mission AND money." "Every 60 seconds another student drops out of high school--that's a million kids a year. Our engagement platform can help reduce that rate to zero," insists Simeon Schnapper, Youtopia's CEO and founder, and a graduate of Impact Engine's second cohort. "While education is estimated to be $1.3 trillion dollar industry, it remains a deeply conservative space. Trying to scale cutting-edge technology like gamification and digital badges required some serious advice." Youtopia learned so much during its Impact Engine experience that the awards component of the Challenge Cup became tangential to the real work surrounding the DC trip. "Thanks to 1776, we met senior White House policymakers to talk about removing innovation hurdles," Schnapper says. "That kind of access can make or break a young company." Moreover, companies that want to disrupt incumbents need support, because doing good means going against traditional thinking. Abby Ross, co-founder and COO of ThinkCERCA, and a graduate of the first Impact Engine cohort, argues that the accepted high-growth technology mantra to 'build one thing and scale quickly' is tricky when it comes to education. "To solve a massive problem like literacy, we needed to build a simple solution for a complex problem," Ross explains. "Some people wanted us to either be a content lesson publisher or a platform of tools. Impact Engine gave us the confidence to build both. And because we took that hard road, it's the only thing allowing us to scale, reach more students, and help schools achieve the only thing in this business that matters the most: student outcomes." Even so, taking the "hard road" doesn't guarantee success if a company can't scale to reach its audience. Consider, for example, the growing population of autistic children: According to Katie Hench, cofounder of Infiniteach, an innovative, digital curriculum for children on the Autism Spectrum, "Autism affects one in every 68 children--a statistic that has increased more than 600 percent in the past two decades alone--and resources aren't keeping up with this growing need. Impact Engine helped us develop a plan for strategic scaling, and taught us how to tell our story with the same Shark Tank-esque glamour that would excite investors, impact or otherwise." Of course, entrepreneurs who aim to do-good-and-do-well must master the art of the shill, just like everyone else. While it's unlikely that Impact Engine's Demo Day or 1776's Challenge Cup will take over ABC primetime anytime soon, I wish Shark Tank's producers would take Templeton up on his challenge: "Find an impact company. Make your first, or next investment in them. Help them grow. Help them find new customers or new business partnerships or new employees. Go to an uncomfortable place. Make an investment in something you believe in. Learn how to be an impact investor, one investment at a time." 1776 and 1871 are revolutionary dates to remember, for a reason. Amen to that. 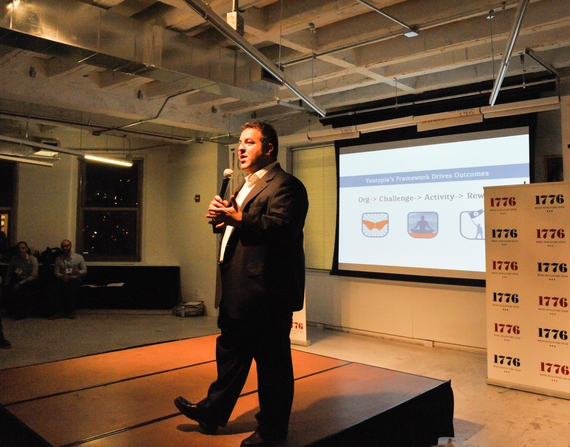 Youtopia's founder and CEO Simeon Schnapper pitching at the 1776 Challenge Cup in Chicago.